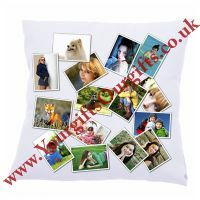 Crushed velvet collage photo cushion were you can add a collection of your favourite photographs to one side or have a double sided montage photo cushion to create a stunning photo montage gift. Choose as many photos as you wish and we will personalise one of our luxury satin cushions with all those special memories. 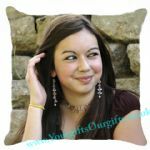 All images will be dyed onto the cushion using the latest in heat dye pressing to ensure a high quality gift and photos that will not fade, peel or crack and cushions are machine washable. 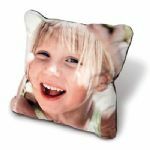 Our satin photo cushions are sizes at 35x35cms, zipped bottom and come with filling included so you have a complete personalised photo gift, so why not add those photos of the kids, loved ones, pets, holiday snaps or all together. 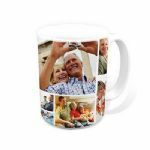 You can even add a message underneath the design but remember this will reduce the size of the photos or have your photos transfered to black and white, all at no extra charge. Once photos have been uploaded they are sent to an encryption server for the utmost in security as we work with alot of children's photos and feel this is the only safe way to deal with your precious photos, hence there will be no preview once you have uploaded them from your pc but if there is a problem with any of your photos we will contact you right away. Once you have sent your details simply add to basket were you can continue shopping or checkout. 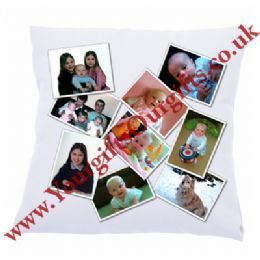 Can i say thankyou for such a wonderful gift and it arrived only two days after i had placed the order, being fit to add so many photos to the cushion made it a brilliant gift for my sister and she loved it, will be telling all my family and friends about your site and will be back with more orders real soon.. I wanted to make a crazy cushion with loads of pics from the internet. Yourgiftsourgifts were amazing with their customer service. I uploaded 30 photos and they carefully made each one work. Letting me know if any of the photos were not good enough. The cushion is OUT OF THIS WORLD and I am so delighted with it!!! I can't get over how caring and efficient they were. They turned my crazy idea into a brilliant reality and I can't thank them enough.